FORMER Wales Captain , Mark Taylor , has stepped down as Wales U20 Team Manager to spend more time with his family . 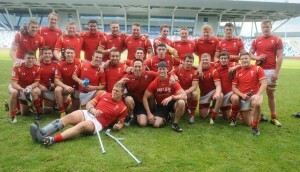 The team’s 42-19 victory over Scotland marked his final match in the role. The former Centre who won 52 Wales caps, scored the historic first try at the Millennium Stadium and successfully captained Wales on four occasions, has been a Wales international pathway team manager since hanging up his playing boots in 2008, first with Wales U18, and for the last six years with Wales U20. Taylor, who also toured with the Lions in 2001, has decided to spend more time with his family and other work commitments, but admits he will certainly stay involved in rugby in some capacity. “It’s been a massive experience for me over the past eight years . It’s been a pleasure for me to be part of the development of young players, especially when you see them go onto play for the senior Wales side. “There have been a lot of highs and some lows in that time, which from a results point of view come down to a few heavy defeats to New Zealand, in 2011 and earlier this week. “One of the biggest achievements was reaching the Junior World Championship final in 2013, when we probably should have beaten England in the final. Hallam Amos, Sam Davies, Steff Hughes and Jordan Williams were key to that campaign, especially in beating South Africa in the semi-final. It was the culmination of two year period under Danny Wilson as coach and the players learned a huge amount from the experience. “One of the highlights of my career, including my playing days, was being involved with the first side to beat New Zealand U20 in 2012. Our team had gone from losing to New Zealand by 92 points the year before, with the likes of Liam Williams and Kirby Myhill in the side, to come back 12 months later and turn them over. The likes of Tom Prydie, Samson Lee and Rob Evans were in that side, the match was played in some of the worst conditions imaginable and that victory was right up there in terms of special moments. “Despite a few results going against us during this tournament in Manchester, the current crop of Wales U20 players also created something special in winning the Six Nations Grand Slam. The team manager role started quite small with Wales U18 , but a number of players who have gone on to become household names were in Taylor’s sights from the start. Tom Prydie, George North, Eli Walker, Aled Davies, Matthew Morgan and Rhodri Jones were in the first Wales U18 squad Taylor was involved with in 2009, with Samson Lee, Rob Evans and Ellis Jenkins joining the party a year later. “I was asked if I wanted to take on the role and I saw it as a good way to stay in touch with the game. I was involved with talent identification and also some of the backs coaching under Darren Edwards, who was with London Welsh at the time. “Tom [ Prydie ] was outstanding for us in a Five Nations tournament in Italy and went on to become capped by Wales in the Six Nations the following year , before playing for us again later that season in the next Five Nations tournament. George North was the star of that tournament in Llandovery and was capped by Wales later that year. WRU Head of Rugby Performance , Geraint John , paid tribute to Mark Taylor’s contribution to the Welsh Rugby Union over the last eight years. He said: “It has been a pleasure working with Mark since my return to Wales and he will be a great loss. He is an excellent Team Manager, well respected by all players and staff and is well loved in the office with his professionalism, passion and humour. We totally understand the reasons why Mark is stepping down as family is very important.